The Vindhya mountain range is still waiting for him to return. But he will not return for if he does then Vindhya will once again raise his head in pride and block the path of the sun. There is another reason why Agastya went south in the first place. It is also said that once all the Rishis from all over the world went North to hear Shiva reveal the secret of the Veda and the Tantra. This caused the earth to tilt and so Shiva asked Agastya to go south and restore the balance of the earth for the spiritual weight of Agastya was equal to the weight of all the other Rishis put together. Agastya’s had two fathers, the Vedic gods, Mitra and Varuna, and one mother, the nymph, Urvashi. He never wanted to marry and have children. But he was haunted by the vision of his ancestors hanging upside down over a bottomless abyss. There they would stay, they howled, until he married, fathered children and helped them be reborn. And so after crossing the Vindhyas, Agastya asked a king for his daughter’s hand. The king, who lived in the region of Vidarbha, however was childless. “I give you the daughter I do not have,” said the king. So Agastya said, “You will soon have the daughter you do not have now but will soon give me.” Agastya then created a woman with his magical powers using the most beautiful parts of the birds and beasts of the forests. Since this woman was created by the loss (lopa) of the most beautiful features (mudra) of animals, she came to be known as Lopamudra. She was given to the king who then gave her in marriage to Agastya. Lopamudra followed her rather short and stout husband dutifully but requested that he treat her as a princess that she was. “Approach me in clothes that are beautiful on a bed that is comfortable in a house that is prosperous.” Agastya, being an ascetic, had no access to such clothes or bed or house. So he went to other kings and sought gifts that would enable him to please his wife. Agastya amazing digestive ability led him to drink all the waters of the oceans enabling the Devas to find and kill Asuras who had hidden underwater. Later, he urinated out the water, and this, say some, is why the sea is salty. On his journey south, Agastya carried a pot of Ganga water. When this pot was placed on the ground in South India, Ganesha, in the form of a crow, some say a rat, caused it to tip. Water flowed out of the pot and turned into the river Kaveri. To remind him to the Himalayas, Agastya also carried with him two hills from the North. These were hung from two ends of a stick balanced on the shoulder of a Rakshasa called Hidima (a style of transportation called ‘kavadi’). In the South, one of the hills became extremely heavy making it impossible for Hidimba to carry it further. On investigation, Agastya found a boy sitting on that hill. “These hills remind me of my home in the North,” said the boy. Agastya realized the boy was Kartikeya, the son of Shiva, who angry with his father, had moved south. Agastya asked the Rakshasa to plant the hill in the South wherever the boy asked him to. 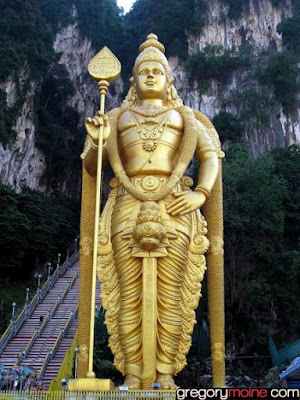 That hill is now called Palani in Tamil Nadu and is the sacred shrine of Kartikeya locally known as Murugan. 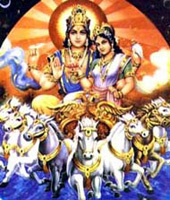 Agastya and Lopamudra are associated with hymns found in the Rig Veda. Both are said to have popularized Lalita Sahashranama, the 1000 names of the Goddess. 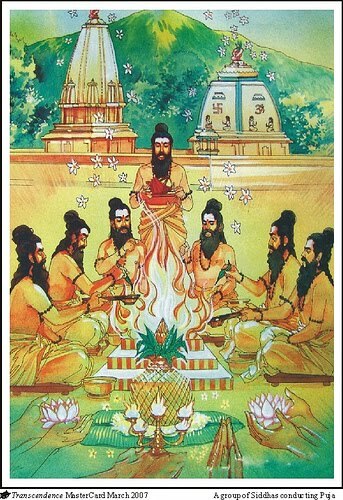 Agastya is renowned in the South as the father of Siddha, the southern form of Ayurveda. He is also associated with occult arts of architecture and forecasting as well as formulation of the Tamil language. Even today a mountain peak between Tamil Nadu and Kerala associated with rare medicinal herbs is called Agastyamalai, or Agastya’s hill, a reminder of his presence in and contribution to civilization in South India. 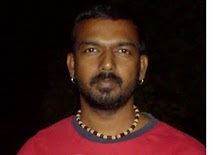 Vijayakumar Allagappan will be organizing a trip to sacred places in India. He has selected temples and other ancient powerful places which resonates with and complements the energy of his teachings. This trip to India in particular offer access to temples which are known to give specific relief from many problems, including health, finances, relationship and restlessness of the mind. Experiencing these temples and performing specific rituals in them can help remove many karmic burdens that one carries. The most important remedies suggested by the siddhas, is going to certain energy vortexes in India where temples have been built around the destiny changing vortexes. As soon as you enter the vortex at the right time you dissolve your bad relationship karma, bad money karma or bad health karma. There is a specific vortex for every type of problem and this has been documented in scriptures. NOTE:COST OF TOUR, AIR TICKET AND AIRPORT TAX ARE SUBJECT TO CHANGE. PLEASE NOTE THAT OWING TO UNAVOIDABLE CIRCUMSTANCES REARRANGEMENT OF THE TOUR PROGRAMME IS AT THE DISCRETION OF THE TOUR ORGANISERS. The ancient mystics has contributed many customs and cultures to the Indians in India and thus brought many richness in Indians customs and culture. Lets take the custom of sprinkling turmeric mixed water around the house before prayers and after. Its known that turmeric has antioxidant, antibacterial and anti-inflammatory qualities. Ofcource, its helps more if its being consumed, but sprinkling it around the house helps prevent from bacteria to spread around. Its been widely used in Indian houses whom are pious. This practice is often said absurd because sprinkling turmeric water is said to be uncivilized, but apparently the houses whose houses have turmeric water sprinkled has less news on the people inside the house falling ill.
Another popular custom among the villagers in rural area is pasting cow dun on walls, outside their house. Yes, its disgusted and ridiculed by many, but did you know, that this cow dung is absolutely rich in minerals and a great factor for antibiotic? Sticking this around their house helped prevent various diseases/viruses from attacking the people in the house. Its funny that things like this is the best way to help us from getting infected and what not. Another cow-related custom is the cow urine. Some of them sprinkle cow urine around the house as well. In ayurveda it is said, "gavyam pavitram ca rasayanam ca pathyam ca hrdyam balam buddhi syata, aayuh pradam rakt vikar hari tridosh hridrog vishapaham syata". It simply means that the cow urine panchgavya is great elixir, proper diet, pleasing to heart, giver of mental and physical strength, enhances longevity. It balances bile, mucous and airs and a remover of heart diseases and effect of poison. It is being recommended by some doctors to some heart patients that they should consume cow urine for health purposes. Well, sprinkling it around the house promises more or less the same, that it has health significance. 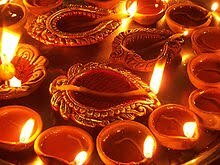 Burning some oil lamps in temple, some may lit ghee lamp, some gingerly oil lamp and such, burning those lamps actually will generate some positive energy up and touches your body, it gives good vibes and such. More than what it should benefits your prayers, its more beneficial for your own self, and body. To the people who visit Lord Vishnu's temple, they should be aware about the 'thulasi theertham' that is given to the devotees after each prayers for the Lord. The priest will give each devotee a spoonful of basil water for us to consume. To those who are good in scientific knowledge, you should know that array of flavonoids exist in basil, which help to protect cells and chromosomes from damage. Studies have shown that two of these flavonoids in particular, orientin and vicenin, are useful in protecting cell structures and chromosomes from damage by radiation and oxygen. And not to mention, recent studies has showed that basil tree/leaves should be consumed in order to keep our immune system strong to help prevent the H1N1 disease. The Gods or Goddesses will personally become present in the jothi for you when you light lamp in your house. This is the secret behind lamp jothi worship. The lamp jothis also have the power to neutralize negative forces since they bring the divine inside your house. They are a simple way of marshalling the divine force to drive away the negative forces from your house. The departed soul (ancestral beings with great spiritual power who are responsible for the spiritual welfare of those souls that are part of their blood lines) also can make themselves present in the lamp jothi. When the pithrus are present in your house, they will bless you with contentment and peace of mind. Wherever they go, they bring goodwill and peace with them. When can one perform lamp worship? It should be done twenty four hours a day, according to the Siddhas. But if you can't do that, make sure you do it in the morning, noon and evening. If you can't do that either, do it at least in the morning and evening. If not, definitely in the evening. The basic rule is that the longer the lamp jothi is lit in your house everyday, the more spiritual your house will be. The Siddhas insist that the spiritual aspirant must never allow the oil to run out in the lamp. Always ensure that there is enough oil in the lamp for the jothi. When you think it's time to cool the jothi, drag the wick by its tail portion into the oil while saying Om Santha Svaroopiniye Namaha. This is the proper procedure for cooling the lamp. Subscribe :Julia Roberts, the star of the movie "Eat Pray Love" tells Elle magazine that she and her entire family are practicing Hindus, making her the most prominent convert to one of America's smaller but increasingly prominent immigrant religions. Roberts, 42, tells the fashion magazine that she and husband Danny Moder and their three children, 5-year-old twins Phinnaeus and Hazel and 3-year-old Henry, all go to temple to "chant and pray and celebrate." "I'm definitely a practicing Hindu," says Roberts, who grew up with a Catholic mother and Baptist father. That seems to make her the most famous convert since the late George Harrison, a member of the Beatles who embraced Indian mysticism in the 1960s. On the other hand, "conversion" may not be the best term for someone who starts practicing Hinduism. "As a non-proselytizing, pluralistic faith, Hinduism does not seek converts nor does anyone need to 'convert' formally to become a practicing Hindu," said Suhag Shukla, managing director of the Hindu American Foundation, which advocates on behalf of the estimated two million Hindus in the United States. In that light, Shukla said there are "countless examples of prominent people in the West who have drawn inspiration from Hindu philosophy, converted formally or for all intents and purposes could be considered practicing Hindus" -- including Ralph Waldo Emerson, Henry David Thoreau, Aldous Huxley, Alfred Ford (great-grandson of Henry Ford) and Ricky Williams, the NFL running back. 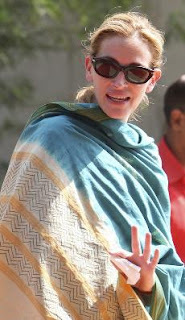 Roberts' revelation is an interesting one because she provoked the ire of many Hindus in India during filming of "Eat Pray Love" last fall when the production team sealed off a temple near Delhi at the start of Navratri, nine days of worship of the Hindu goddess Durga. The movie is based on the popular memoir of the same name by Elizabeth Gilbert that recounts her global quest for spiritual and romantic fulfillment. 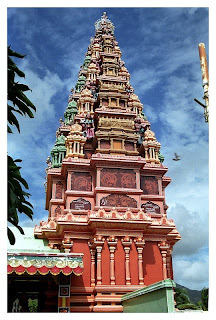 The filming at the temple portrays how the heroine explored Hinduism. That Roberts publicly embraces Hinduism is also notable at a time when some notable politicians -- as Politics Daily reported -- are leery of associating with a religion that still arouses such suspicions that evangelist Franklin Graham openly derided it last May, saying: "No elephant with 100 arms can do anything for me. None of their 9,000 gods is going to lead me to salvation." On the other hand, many Hindu beliefs and practices are becoming mainstream. Sarah Palin is one of millions who have adopted yoga poses as part of their fitness routines. In an essay titled "We Are All Hindus Now," Newsweek's Lisa Miller wrote that two-thirds of Americans believe -- as do Hindus -- that many religions can offer eternal salvation, not just Christianity. And more Americans than ever are choosing to be cremated at death, which is the traditional Hindu practice. Moreover, one-quarter of Americans (24 percent in a 2009 Pew survey) believe in reincarnation. 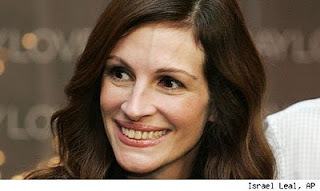 Even Julia Roberts is hoping for some improvement in her next life -- though many of us would wonder how that could be possible. "Golly, I've been so spoiled with my friends and family in this life," she tells Elle. "Next time I want to be just something quiet and supporting." She also says she's not going to try to get a jump on reincarnation by using plastic surgery in this life. "It's unfortunate that we live in such a panicked, dysmorphic society where women don't even give themselves a chance to see what they'll look like as older persons," she says. "I want to have some idea of what I'll look like before I start cleaning the slates. I want my kids to know when I'm pissed, when I'm happy, and when I'm confounded. Your face tells a story . . . and it shouldn't be a story about your drive to the doctor's office." That may be something else a lot of American Christians would disagree with. Hinduism is probably the oldest continually practiced religious and spiritual tradition on the planet, with its roots going back over 5,000 years. In fact Hinduism has no specific point of origin or end. The basis of Hinduism can be found not in a particular prophet or prophets or in a single book but in the eternal, in the cosmic mind itself, accepting a variety of great teachers and teachings over the long course of time and the different types of human cultures. Hinduism has never rejected any aspect of human religious aspiration, whether it is the use of images, a variety of rituals, or many techniques and approaches to meditation. Hinduism is the third largest of the world's major religions, with over a billion adherents worldwide. It is the largest of the non-biblical traditions. It is the largest of the pagan traditions and the best surviving of the great pagan traditions that once dominated the world and traces of which remain everywhere. It is the largest of the native or indigenous traditions being rooted in the land and life of its peoples. Hinduism is firmly rooted in nature and honors all aspects of the natural world as sacred. Its holy places are not simply sites of important human religious activity but sacred mountains, rivers, rocks, trees, and flowers. Yet perhaps most importantly Hinduism is the largest of the world's ‘pluralistic' traditions. It does not emphasize one formulation of divinity, one prophet or savior, or one holy book for all. It honors a variety of great gurus and their various books and teachings. Under its vast scope it can embrace a great variety of religious views and practices. This makes Hinduism the largest of the world's non-proselytizing religions. Hinduism does not seek to convert the world to a single belief but holds that we should honor the unique divine expression in each person and in each culture. It gives people the freedom to follow whatever spiritual path they find valuable. Hinduism can even accept atheists as part of its honoring of freedom of thought and inquiry. Hinduism is more an ‘experiential spiritual approach' than a religious belief system. It directs us to our own individual spiritual practice, which it calls sadhana. Hinduism contains a vast science of yoga and meditation, including such diverse practices as asanas, mantras, meditation methods, rituals, and pilgrimage. It is not just a religion but is also a ‘spiritual science' embracing systems of healing for body and mind (Ayurveda), astrology (Jyotish), architecture (Vastu), music, dance, literature, and even a science of language (Sanskrit). Hinduism is an entire culture and way of life with its own attitudes about food, vocation, and our relationship with the universe as a whole. It religious gatherings like the Kumbha Melas have tens of millions of participants, making them the largest such gatherings in the world. Hinduism traditionally calls itself Sanatana Dharma or the eternal way of truth. It is the formulation of a universal tradition that is adapted locally to individual and community needs. As such, Hinduism has a wonderful vision of the future and embraces all of time. 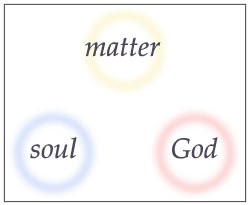 It holds that each individual soul is on a unique journey to Self-realization and God-realization, union with divinity within, through the course of many lives. It strives to offer the aspiring soul all the tools, aids, and inspiration to move along that path with wisdom, grace, and compassion. The Council for Scientific and Industrial Research (CSIR) has prepared patent formats of nearly 900 yoga asanas (postures), to prevent European and American companies involved in fitness-related activities from claiming them as their own. These asanas will all be included in the digitalised Traditional Knowledge Library (TKDL), set up by the council to collect and record traditional treatment therapy knowledge. 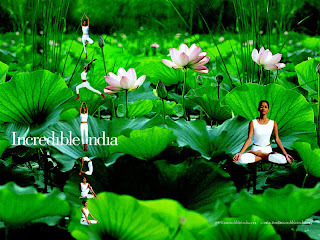 Medicines and yoga asanas registered with it enjoy the status of being patented. "Video recordings of the asanas are also being made and recorded to prevent them from being stolen," said TKDL director Dr VK Gupta. The CSIR began the project in 2006. These 900 asanas have been collected from Patanjali's classic work on yoga, as well as other ancient classics like the Bhagwat Gita. Gupta said a number of countries had already laid claim to around 250 of these postures. Some foreign companies have even patented some of them. Foreign companies have been selling some of the yoga postures as therapies to relieve stress or backaches. "How can someone else patent these asanas which are a part of our traditional treatment therapy knowledge? They should not be allowed to use them for commercial purposes," Dr Gupta said. The CSIR's next step will be to move against the yoga patents already registered abroad. The United States patent office alone has issued around 3000 patents on yoga postures and their variations. 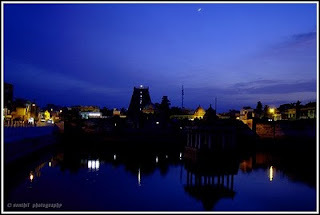 Vijayakumar Allagappan will be organizing a trip to sacred places in India. This tour offers a unique opportunity to explore the energies and subtle vibrations connected with the mantras and meditation based on his teachings. He has selected temples and other ancient powerful places which resonates with and complements the energy of his teachings. This trip to India in particular offer access to temples which rarely opened to non-Indian natives and are known to give specific relief from many problems, including health, finances, relationship and restlessness of the mind.Experiencing these temples and performing specific rituals in them can help remove many karmic burdens that one carries. What is Karma? Karma is the fabric of your life, and it encompasses almost all of the experiences that we go through life after life. Ever wondered why some people have tons of money, great romantic life and vibrant health while many others suffer for the want of it. This is due to karma which rules all aspects of human life like health, wealth, education etc. What is Ancestor Ritual? Spiritually speaking there are two reasons for all of our mundane problems. One caused by the planets, the other by departed spirits. Just as there is biological lineage of transference of DNA along the family line, there is spirit lineage. We should constantly take care of them in order to have a peaceful life. Dead ancestors can help solve your money, relationship, health and other problems quite easily if one knows how to communicate and connect with them through Tantric Ancestor ritual. The game had its origin in India and was called Moksha Patam or Parama Padam or Mokshapat. It was used to teach Hinduism and Hindu values to children. 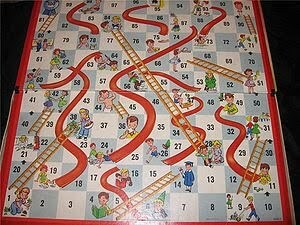 The British renamed it as Snakes and Ladders. Now, when and who created this game? Most people believe it was created by the 13th century poet saint Gyandev. There are certain references which take the game back to 2nd century BC. The ladders represented virtues and snakes vices. 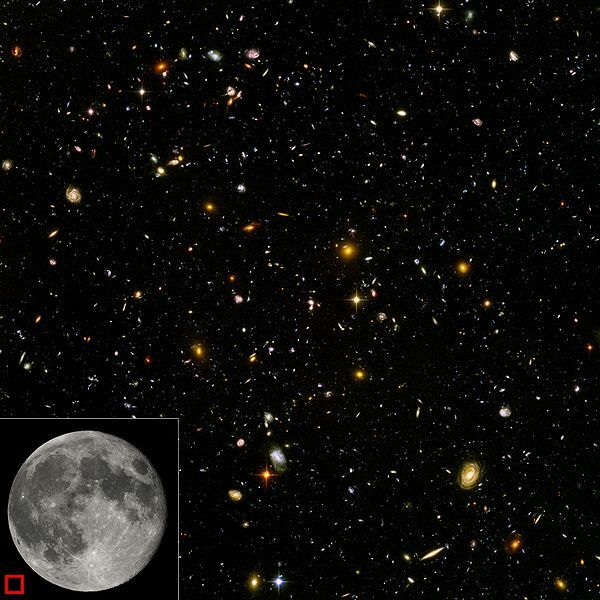 In the original game square 12 was faith, 51 was Reliability, 57 was Generosity, 76 was Knowledge, and 78 was Asceticism. These were the squares were the ladder was found. Square 41 was for Disobedience, 44 for Arrogance, 49 for Vulgarity, 52 for Theft, 58 for Lying, 62 for Drunkenness, 69 for Debt, 84 for Anger, 92 for Greed, 95 for Pride, 73 for Murder and 99 for Lust. These were the squares were the snake was found. The Square 100 represented Nirvana or Moksha. Day: Monday & Wednesday from 3pm - 4pm @ Sentul, K.L. Day: Tuesday & Friday from 3.30pm – 4.45pm @Jln. Ipoh, K.L. Day: Saturday from 3.30pm - 5pm @ Ampang, K.L. Call us for other location in K.L. and additional schedules. I.: What is Hindu Religion?1. Hindu Religion, often referred to as Hindu Dharma, Vaideeha Dharma and Sanatana Dharma, is the world's oldest Religious faith. It was followed by the ancient civilization of the Indus valley, Ganges valley, Deccan and Cauveri delta, as well as other parts of India all over the Indian peninsula and surrounding areas of Asia. This Faith, known by many names, is followed and practiced in several ways and forms as it was practiced several thousand years back, with very little modifications, though it adjusted itself to the various times. 2. There are over 900 million to one billion Hindus living throughout the world, mainly in India, Nepal, Sri Lanka, Malaysia, Singapore, Thailand, Cambodia and Indonesia from ancient times and also the Hindus settled all over the world now. There are also many new converts and followers to this practice in the modern world. 3. Hinduism, is as much a "way of life" as a religion and affects every aspect of life for Hindus from birth throughout their life. It is followed by the devout Hindu in every aspect of life and activity, and not just in a prayer only. 1. Hinduism, unlike most religions, has no founder and no one scripture. Hindus do not have one "Holy Book" like many other religions, but many texts including the four Vedas along with their Upanishads, called the "Sruti", several Dharma Sasthras or Smrutis, Ithihasas and Puranas including the Mahabharata and the Ramayana. 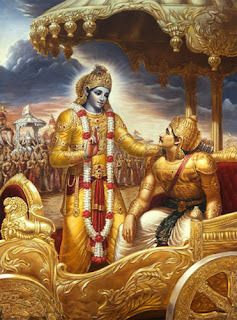 The Bhagavad Gita, or "Song of God", comes as part of Mahabaratha, is an essence of the message of the Upanishads and Hindu Philosophy and is considered to be a guide on how we should live as told by Lord Krishna to Arjuna. 2. Hindus believe that as all streams and rivers lead to the same ocean, all genuine religious (spiritual) paths lead to the same goal; worship of every form of "GOD" and celestial forces leads to the same good. So they do not try to convert others to our religion. Each one is allowed to pray and worship to a form or a formless according to one's own knowledge, desire, need and spiritual elevation. 3. 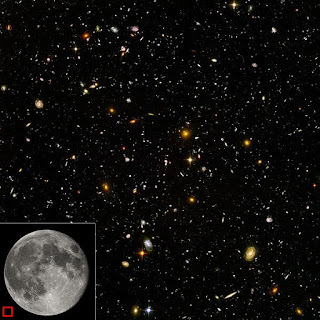 Hindus believe in One God, beyond form, space and time and beyond human comprehension. They believe that God is Transcendant and Immanent at the same time and will create Itself according to everyone desires and needs to protect the pious, to destroy the evil and establish the Divine Rule of Law and Justice. So, they belive that God will come to them in every form one desires and prays according to one's need and wish. 1. Most Hindus, needing a form on which to concentrate, worship that one God in different forms, worshiping one aspect of that One Divine Supreme Truth - Paramatma. Hindus see God in masculine as well as in feminine forms and also like a family. At the same time, they all understand the True nature of the Supreme. 2. Hindu "Gods" are worshipped in the various incarnations, manifestations and forms as created by the supreme God Paramathma for the benefit of the Human creations to easily comprehend Him as He is. Hindus see that One God taking the masculine forms as Brahma - the creator, Vishnu - the protector and maintainer, and Shiva as Siva Nataraja - the destroyer and re-creator. Hindus see that One God in the female forms as Sakthi or Durga - provider of energy and power, as Lakshmi - provider of prosperity and wealth and as Saraswathi - provider of knowledge and intelligence. 3. Please understand that many of the sects of Hindus following the various forms of philosophy and worship andvisualize this same Paramathma - the Supreme God - as Paramasiva [Siva] and Paraasakthi [Sakthi or Durga] or as Narayana [Vishnu]. These are the major forms of Paramatma is understood and worshipped by the various sects of Hindu Devotees. 4. Here please note that unlike the other major world religions, Hindus also see the Supreme as Mother, including as Sri Meenakshi, as Visalakshi, as Kamakshi and as many other names of Sakthi. He is also seen as Father as in Siva in various forms in several Hindu Temples. The Temple in which they are worshipped is not just a congregation hall but a palace of the Supreme God [as the Queen or King]. The dovoted Hindu is able to obtain his or her comminion with the One Supreme God through the prayers to any of the forms as they see that One Supreme in every form or aspect they worship. 1. Hindu worship takes into account the capacities and inclinations of different individuals. 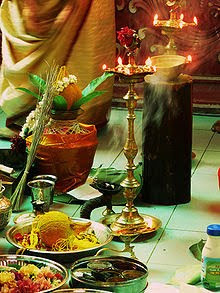 Types of worship include Ritualistic worship (temple or home), offering (directly or through the priest) flowers, coconut, fruits, incense, flames of oil lamps and camphor, chanting of prayers in Sanskrit (or their mother tongue), etc. 2. Also: Worship through service of one's fellow man (charity) and by one's activity; Worship through studying of sacred texts and devotion to the Supreme; Worship through meditation with physical and mental discipline and through understanding first the inner self then the divine that is everywhere. Worship and prayers are the duties of the human soul to attain Divine protection from the effects of bad karmas and to get guided in the proper path. 1. Hindus believe in Ahimsa, or non-violence, which is the basis for the vegetarian diet of many Hindus. Hindus believe non-injury or Ahimsa in all activities which include thought, word, and deed. Hindus believe in Truth and that the Truth will ultimately prevail and protect. Hindus believe in following the Dharma or the divine Law that will protect them at all times. 2. Hindus believe in Karma, the law of Cause and Effect. Similar to Christian "As ye sow, so shall ye reap" or "What goes around, comes around." (No such thing as a free lunch.) Hindus strive to follow Karma Yoga which is Doing one's own duty without expectation of any rewards for it. 3. Hindus believe in reincarnation, or "life after life." (Results may occur in a following life.) Every individual soul returns to earth several times by rebirth to perform proper Karma to purify itself. Once purified by good karma, the soul reaches liberation with no-rebirth. Attachment, greed and lust leads to bad karma leading to grief and further suffering and rebirths to wash off those effects. 4. A goal of Hindus is to achieve Moksha, to be freed from the cycle of birth and death (when the "good" and the "bad" karmas balance.) or to reach Swarga, the abode of the Divine Soul or Paramatma [God] to serve at His feet. Day: Monday - from 7 pm – 8.30 pm @ Jln. Ipoh, K.L. Day: Wednesday - from 7 pm - 8.30 pm @ Sentul, K.L. Day: Sunday - from 7am - 9am @ Ampang, K.L. Call us for other location and additional schedules. Indian Knowledge System Academy (formerly known as Ampang Arts and Yoga Studio) was founded in April 2004 by Vijayakumar Allagappan who has done extensive studies and research in the area of Ancient Yoga, Tantric Astrology, Hindu Rituals, Practices, Symbolism and their Sciences, The Caste System, The Connection between the Universal Soul, The One God and Myriad Gods and Goddesses, Karma, Dharma and Reincarnation. The Ancient System known as Sanathana Dharma (Hinduism) was created with the full understanding of the practical order of natural living. Rites, Rituals, Customs and traditions observed from our birth down to the practices during our death even after it were perfectly designed to create a balance between ourself our surrounding and the cosmic consciousness we call God. But this great Science and Art created by our ancestor are slowly fading in the age of computer and technology replaced by make-believe rituals that are of very little benefit to human society and nature. So how we can regain this loss of our Great Ancient Wealth where our 21st century YOUTH want FACT to decide what they can accept or reject. We can start by answering them scientifically and practically to simple question like ...... Why so many Gods in Hindusim? What is the scientific reason for Lord Ganesha with elephant head? What is temple and the science behind each ritual in it? Why Caste System was created and its true meaning? Why it is important to perform ancestral rituals? By answering this questions they will understand the importance and appreciate our own culture, customs, sciences and arts. Vijayakumar Allagappan Has Been Studying & Researching the Art & Science of Living in Hinduism, Ancient Yoga, Tantric Astrology, Hindu Knowledge System, Tantra, Mantra and other Esoteric Science for More Than 13 Years. He Has Wide Experience in Tantric Astrology Consultancy & Has Deep Insights in Human’s (Cosmic) Behavior pattern & Body-mind Science. He is also a Visiting Faculty for various Educational Institutions and sharing the knowledge with thousands of others through his regular free public talk. He is one of world`s leading Esoteric Science Blog writer, Yoga, Art & Science of Hinduism Teacher, Tantric Astrology Consultant, Public speaker on Art & Science of Living in Hinduism and researcher of Hindu Worships, Customs, Rituals and Symbols. He is researching and decoding the sacred stories, myth, rituals, customs and symbols of Hinduism for Today`s Modern World scientifically and spreading to the whole world through writing, teaching and giving public talks. He says Mythology must never taken literally, because mythology stories and symbols are code, a medium through which the siddhas and yogis are communicating profound messages. In 2005 after in-depth research and pilot studies he has developed a Super Kids Program for children by using ancient Indian mystic’s technique to enhance intelligence, memory power, creativity and emotional balance. The children in the program have showed remarkable changes in their behavior and improvement in their intelligence and comprehension. Even the adults also show improvement with this program. He has successfully introduced this program to thousands of children in more than 2o primary and secondary schools for the past 5 years. He says all our problems and difficulties that occur in our life are due to ignorance. He believe wisdom is our birth right so he call everyone to learn our priceless wisdom tradition of ancient civilisation designed by Indian mystics so that we can destroy our ignorance and enjoy greater health, wealth, prosperity and enlightenment in this life. In Hindu society from ancient times, the child is given a name by his/her parents with the name having deep meaning and starting with first alphabet of his/her Nakshatra. Most of the names are either related to God or other good things. By simply hearing the name one can judge about the nature of the person. 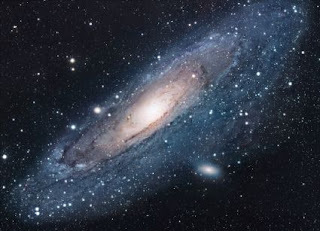 The main reason to choose a name based on Nakshatra is that it vibrates in harmony with the nature of the individual in this particular incarnation, by virtue of its unique relation to the moon at the moment of birth, which has a significant impact on the inner, emotional nature. The moon is associated with consciousness, particularly with the right brain. Each phase of the moon carries its own special energy. According to traditional astrologers, among the most auspicious Hindu first names begin the syllables that corresponds to one's birth star, called Nakshatra, which is the constellation with which the moon was aligned at the moment of birth. In ancient days, as today, this first sound of the first name was extremely important to knowledgeable preceptors. This table shows the suggested letters to start your baby's name, depending on their birth star. "Wishing Everyone Happy Ponggal and a New Year. May all your wishes come true and GOD bless you with Good Health, Prosperity and Enlightenment this year !" From January 14th, the Sun begins its journey northward as it transits into the constellation of Capricorn, signaling the end of darkness and the return of ever increasing daylight through July 16th. 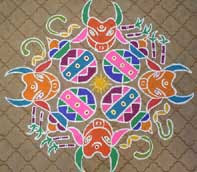 In astrological terms, it is the Vedic Winter Solstice and in India it is referred to as “Pongal”. The transit is a powerful opportunity to change your old ways and rewrite the rules for the next year. Your old ways might not have brought you the affluence or poignant happiness that you have been yearning for. The celebrations associated with this transit carry a strong vibration which can stir up your awareness and help you receive what you rightly deserve. The morning of January 13th prior to the transit is the time to clean your homes and your mind. Run through your closets and throw out old items from the past that no longer has a place in your life. Spiritually this is the time to overhaul of your current self and getting ready for a higher self. This festival celebrates leaving behind the old way of doing things, be it relationship, money matters or health habits. 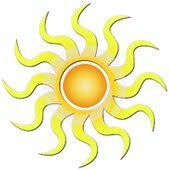 The first day of the Vedic New Year, Thursday, January 14th, is the day when Sun enters the sign Capricorn. Winter comes to an end and there is a gradual onset of sunny days. It is interesting to know that even Indra, the king of heaven, rejoices during this time of abundance, fun, luxury and happiness. The Sun governs your health; both physical and mental, self-esteem, proper functioning of the heart and your vision. On the Winter Solstice the Sun moves into Capricorn forming an auspicious "yoga" or configuration with Jupiter. The Sun remains in one sign for 30 days. Fortunately, the Sun and Jupiter will be continuing to form auspicious yogas even though the Sun will transit into the next zodiac signs. These good luck times continue when the Sun is in Aquarius, Pisces, Aries, Taurus, and Gemini which ends on July 16th. Accelerating the benefic effects of the Sun using remedies can augment your good luck time, like sailing with the wind at your back. 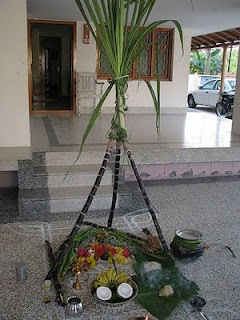 Thai Pongal generally includes customs & celebrations that are the expression of jubilation over life's renewal. On Thai Pongal, the family begins the day early. Every member of the family gets up early in the morning, bathes, puts on new clothes and gathers to cook the traditional Pongal (rice pudding). The front garden is pre-prepared for this ceremonious cooking. A flat square pitch is made and decorated with kolam drawings, and it is exposed to the direct sun light. A fire wood hearth will be set up using three bricks. The cooking begins by putting a clay pot with water on the hearth. A senior member of the family conduct the cooking and the rest of the family dutifully assists him or her or watches the event. When the water has boiled the rice is put into the pot - after a member the family ceremoniously puts three handful of rice in first. The other ingredients of this special dish are chakkarai (brown cane sugar) or katkandu (sugar candy), milk (cow's milk or coconut milk), roasted green gram (payaru), raisins, cashew nuts and few pods of cardamom. When the meal is ready it is first put on a banana leaf and the family pray for few minutes to thank the nature sprit, the sun and farmers. Then the meal (Pongal) is served with fruits (banana and mango) among the family. 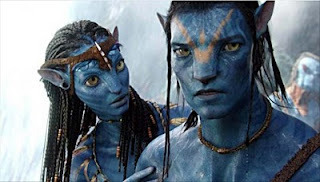 Avatar, a 2009 movie directed by James Cameron, has several spiritual lessons embedded in it. Here are the top 5 spiritual lessons from the well acclaimed must-watch movie. 1. Everything is Alive. 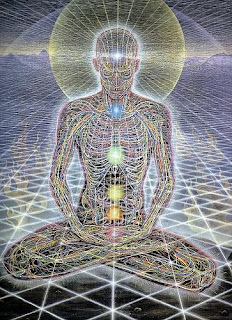 Each particle of creation is filled with awareness, life force energy, spirit, and intelligence. These objects have different consciousness than ours. The universal consciousness, also known as 'Animism', is an integral part of several primitive cultures. This beautiful planet on which we live is not a dead lump of rocks circulating around the sun in space. Everything in this earth is pulsating with energy. Every culture knows it differently. Chinese calls it Chi, Indians call it Prana, Japanese call it Ki. The "bio-botanical neural network" described in the movie is real and we can experience it by increasing our consciousness. If there is one thing that I take home from this movie, it is that we should treat this earth and every living and non-living thing on this earth with respect and love. The "tree of souls" is as real as you believe it to be. 2. Love is the most powerful purifier of all. When our heart is filled with love, it heals us. This positive frequency goes out from us and resonates with everything around us. The heart filled with love creates electromagnetic field that affects the physical, emotional, intellectual, and spiritual well-being. Love purifies the spirit. It cleanses the soul. 3. Everything is born twice. 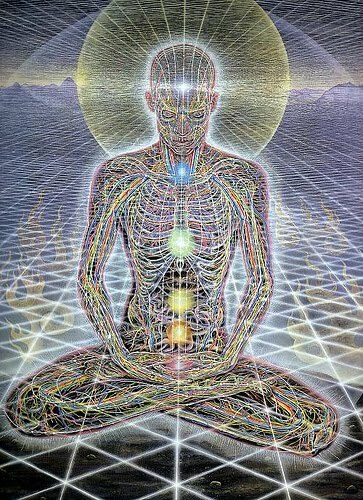 Your physical birth is simply the beginning of your consciousness. What you do with your life and how you earn your place in the community decides your second birth. Most people never reach the level of consciousness to be born again. To be born again, a person has to earn his or her place in the community. A real warrior has to earn place in the community by cultivating fearlessness and good heart. 4. Balance is the key to all life. "Mother earth does not take sides; she protects only the balance of life," a quote from movie reveals that mother earth promotes balance and harmony over everything else. Several Hindu and Zen spiritual theories promote balance and harmony as well. For long term sustainability, nothing takes precedence of balance. 5. This world is a collaboration of energies and every individual has something to contribute. Everybody has a purpose in life. Living a purposeful life puts you in attunement with rest of the universe. All the life force energy comes to your aid when your purpose is in attunement with betterment of the universe as a whole. "All energy is only borrowed...You have to give it back" - a direct quote from the movie reveals the quintessential aspect of how energy of both living and non-living things interacts and creates our universe. Living your life by these 5 principles is bound to fill your life with love, joy, and serenity.